This week’s Doonesbury is a powerful comment on a contemporary political movement, the emergence of which over the last few weeks was both long overdue and largely unexpected. Gun-control activism has attracted the energy and attention of America’s youth in the wake of the Parkland shootings. This movement was long overdue because the stakes are so high: accounts of American mass shootings blur together as greedy politicians and lobbyists and firearms manufacturers profit from an insane domestic arms race. It was unexpected because until Parkland, it really seemed as if those Americans who understand the importance of the “well-regulated” part of the Second Amendment had resigned themselves to the fact that, given the political strength of their opposition, they were fighting a lost cause. If twenty dead children and their teachers at Sandy Hook weren’t going to change the country’s moral calculus, many seemed to reason, nothing could. Then Parkland happened and the people with the most at stake in the gun debate – the kids who go to school every day wondering if it might be their turn to die at the hands of an overarmed, enraged young man – took charge, and told their teachers, principals and parents and the politicians, lobbyists and gun nuts that they’d had enough. Their hashtag, #NeverAgain, has joined #MeToo and #BlackLivesMatter as an online reflection of grassroots movements that are presenting a profound challenge to American structures of power. Beyond recognizing the importance of the movement sparked by the Parkland students, the 1 April strip plays on a theme that has been central to Trudeau’s work for decades – his generation’s reckoning with its history, especially the question of how the Boomers failed to follow through on, and ultimately lost, the ideals that had driven them to challenge the establishment in their youth. I have an ambivalent relationship with the Boomers. I’m a student of Boomer-era history (I wrote my dissertation on 1960s radicalism) and a I’m lifelong consumer of Boomer culture. Their generation made huge strides towards of creating new political, social and cultural freedoms. At the same time, as someone living in a world where so much of the 1968 generation’s vision of a better day has yet to be realized, I have a healthy dose of resentment towards a generation that, like their forebears, will not relax their stranglehold on political and cultural power, and will not make room for a younger generation with new energy and new ideas. This week’s strip takes that tension head-on. Sunday’s strip begins with Mark prepping for an interview with one of the Parkland activists. As the interview is wrapping up, Mark asks a question that is completely dismissive of the dedication the young man and and his peers have shown as they have fought the political establishment: “[Having] seen how Washington really works, are you kids ready to call it quits?” Mark’s guest replies that, regardless of the patronizing attitudes that Mark has just demonstrated, these kids “are in this for good, [and] won’t stop fighting until there’s real change!” At that moment, a transformation occurs: Mark sees his past self in the young man sitting in front of him, and is forced to confront his, and his generation’s, failure to follow through on the values they embraced decades ago. That penultimate panel, with present-day Mark looking into the eyes of his enraged younger self, wondering how he lost the passion that drives the Parkland kids, ranks among the most moving moments in Doonesbury history. 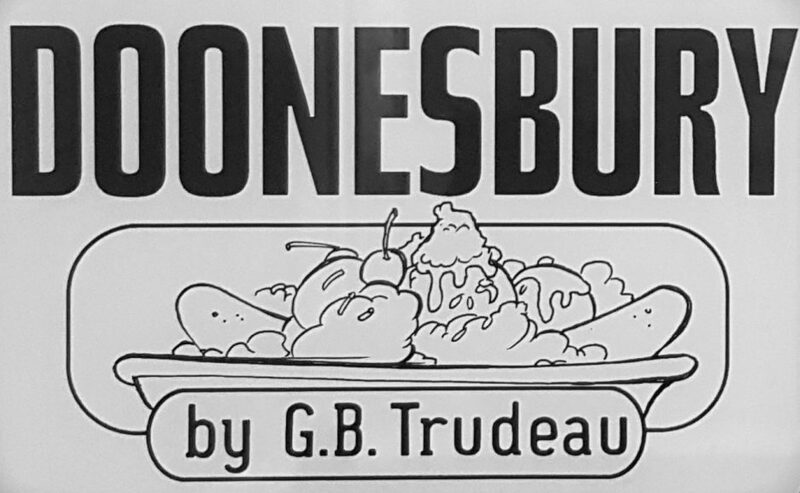 This is the second time in recent months that Mark’s studio has been the setting for a flashback that puts the politics of today in dialogue with those of Trudeau’s youth: on 22 October 2017, Trudeau linked the behaviour of the current occupant of the White House to that of a previously-disgraced president by revisiting one of Doonesbury’s most iconic panels (Here’s the post I wrote about that strip). Yet while GBT might be feeling a little sentimental in our troubled times, his generation’s understanding of its past has been a Doonesbury touchstone for decades. One Doonesbury staple that lets readers trace the Boomers coming to terms with their history is the periodic decade revival parties hosted at Walden. I’ll be looking at later fin-de-decade shindigs later, but it’s the first of two sixties revival parties, held in March 1974 (the second was in 1977), that I want to focus on here. The arc balanced silly fun and black humour: the president of Walden College arrived dressed as himself from five years earlier, ready to negotiate with student protestors occupying his office; other guests showed up as wounded Vietnam vets and Charles Manson, reminding us, contrary to the images of “the Summer of Love” and naked flower children dancing in the mud at Woodstock, the sixties were a fundamentally dark time. At the Walden sixties revival party, Nicole is appalled at some of the costume choices. Doonesbury, 10 December 1974. …meanwhile, President King relives the glory days of the sixties. Doonesbury, 11 December 1974. But it’s a moment between Mike and Mark that foreshadows the sense of generational self-disillusionment that Trudeau addressed in this week’s strip. Mark is dressed as his activist self – black armband, his head bandaged after being beaten by the pigs – and Mike, the ultimate middle-of-the-road liberal, is one of “the Best and the Brightest,” John F. Kennedy’s team of intellectuals whose policy recommendations help lead America into the Vietnam quagmire. At Mark’s request, Mike recites his paraphrased version of Kennedy’s “New Frontier” speech (the actual passage reads: “The energy, the faith, the devotion which we bring to this endeavour will light our country and all who serve it – and the glow from that fire can truly light the world.”). The two young men laugh warmly at the passage, fondly recalling the youthful optimism it encapsulates. Their laughter, however, quickly gives way to a grim understanding: in 1974, with Nixon embroiled in a scandal that would politically disillusion a generation and the war in Vietnam an unmitigated and still-unresolved disaster, it was clear that a generation charged with making their nation and the world a better place had failed to meet the challenge and had lost something vital in the process. Forty-four years later, in an NPR studio, facing a new generation determined to leave the world a better place than what they inherited, the bitter taste of failure still haunts Mark, and it still haunts Garry Trudeau. “The Best and the Brightest.” Doonesbury, 12 December 1974. “What’s happened to us?” Doonesbury, 13 December 1974. And yet, as always, another generation is ready to do what has to be done – push the old folks out of the way and work towards necessary change. In The Wretched of the Earth, the Martinican philosopher Frantz Fanon, discussing the generation that comes to power when colonialism gives way to independence, wrote that “each generation must, out of relative obscurity, discover its mission, fulfill it, or betray it.” Trudeau may well be bitter about his generation’s betrayals of their youthful ideals and mission, especially in these dark times. But more importantly, he hasn’t lost his faith in the energy and vision of youth: the Parkland kids may have come out of nowhere, but they’ve discovered their mission, and they aren’t going anywhere. ‹ PreviousThis Week in Doonesbury: #MeToo Runs for Office.